Actually, the working principle of servo motor is the angle where it will rotate (commanded by a controller) and not at whatever speed it rotates or which direction it will rotates, to right or to the left? No, a servo motor only knows the angle, not direction. If existing position now in the corner 00 and the controller ordered it to spin 900 then it will rotate clockwise. And conversely, if the current position is 1800 and the controller ordered it to spin 450 for example, then the motor will rotate counter clockwise. So once again, the servo motor only knows ‘angle’ parameter not direction or speed. How to Control Servo Motor Speed with Arduino? I will show how to control servo motor speed with set delay giving each movement 10 of angle. By giving a different delay it will get different speeds. 'Speed' rate here is relative value (e.g. fast, a little faster, slower, a little slow, etc). It can’t be exactly measured e.g. 20 RPM, RPS 0.37 RPS, etc). You have to figure out yourself how much delay that corresponds to the speed you need. Next, upload below sketch to your Arduino board. If the sketch has been uploaded, the servo motors should rotates clockwise and counterclockwise alternately with speed rate according to ‘servomtr_speed’ variable in sketch above. Try to change this variable value to suit your needs. 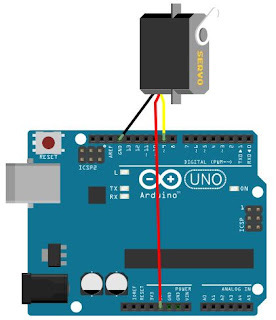 So, it’s a little trick How to Control Servo Motor Speed with Arduino. Maybe you need this trick to slowdown your servo motor in order to join with other parts in your system.